Pick and pack is a critical element in the chain of order fulfilment. At Cliffe Enterprise, we have been in the printing, packaging, and fulfilment business since 1991, delivering the most complex and time sensitive projects for private companies, government departments, and armed forces. Whether you are shipping a few items or thousands of bulk orders, we have the capability to deliver to your clients not only across the UK, but also throughout the world. Order picking and packing is not just about putting items in boxes and then shipping; rather, it is an opportunity for a business to enhance their brand experience. As a result, picking and packing is critical to the success of supply chain management. No customer is ever happy receiving a misplaced, delayed, or wrong order. Unarguably, a customer with a positive experience will come back to place another order. At Cliffe Enterprise, we understand the importance of customer retention and therefore offer unmatched warehouse management services, with multiple checks in place to ensure all of your orders are delivered on time, in a safe condition, containing the right products. Our warehouse management system is designed to calculate the most effective pick route for distribution to minimise the warehouse travel time and ensure orders are picked and packed as efficiently as possible. The majority of our pick and pack projects involve the collation of multiple printed items being placed into envelopes, tubes, boxes and dispatched to individual addresses across the country. We efficiently handle the diversity of packaging, since not all recipients need the same quantity of items or the same number of items. All our pick and pack work is managed by our experienced and dedicated staff. 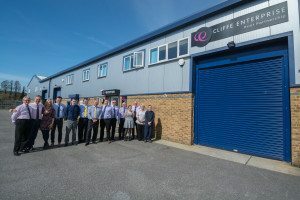 In 2011 to satisfy the demand from our clients for high volume distribution throughout the UK, Cliffe Enterprise joined hands with an established transport company. With over 19 dedicated vehicles ranging from of 3.5 tonne vans to 7.5 tonne and 18 tonne lorries, we have the flexibility to deliver as per the demands of our customers. In addition to our in-house transport, we also offer parcel and pallet delivery services to cover the entire UK, providing our clients with a very broad-based distribution service. We work with a range of clients across different industry verticals and have extensive experience to meet your warehousing and pick and pack fulfilment needs. We have successfully completed several warehouse management projects, which have won us clients for a lifetime. To pick and pack 1.6 million rail timetables (98 tonnes) and distribute to 212 train stations and stakeholders in 7 days. Four year contract twice a year. To pick, pack and deliver high volume publications in various languages to 13 European countries for the Office of Official Publications. To pick & pack and distribute 750,000 printed items to 500 addresses including hospitals, doctor’s surgeries, pharmacies and schools throughout the south east in 5 working days. To pick, pack and deliver large format posters in various permutations to rail stations within the UK. This is an ongoing contract. To pick, pack and deliver various printed items to BFPOs throughout the world for the armed forces over a period of six years. Call us today to discuss how we may reduce your distribution, picking and packing costs.